The galaxy lies at a distance of about 36 million light years from Earth and has an apparent magnitude of 8.9. It has the designation NGC 3627 in the New General Catalogue. Messier 66 occupies an area of 9.1 by 4.2 arc minutes of apparent sky, which corresponds to a spatial diameter of about 95,000 light years. It can be seen in the same field of view as its neighbours M65 and NGC 3628. M66 is separated from M65 by only 200,000 light years, or 20 arc minutes of apparent sky. 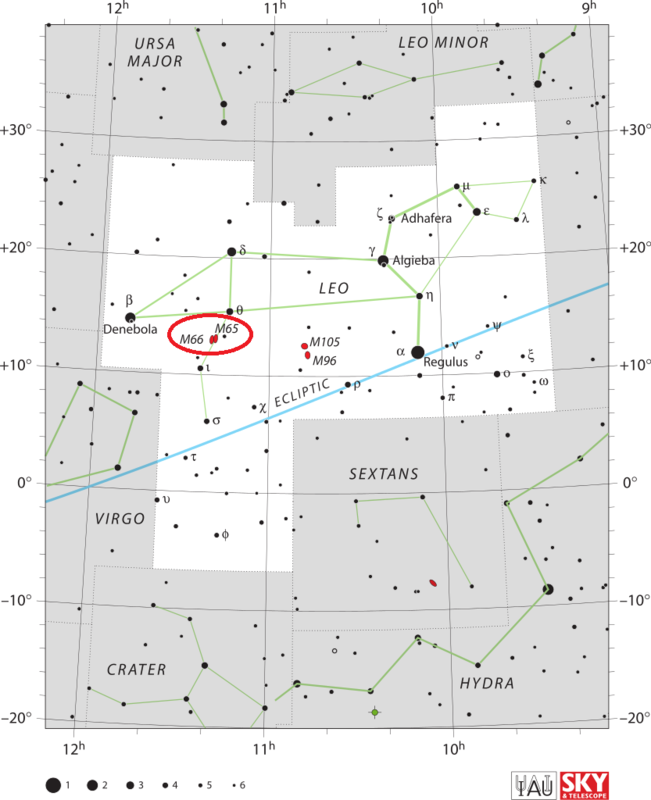 The Leo Triplet can be found between the stars Theta and Iota Leonis, or along the line from the bright star Denebola to Regulus, the brightest star in Leo. M66 is the easternmost of the two Messier galaxies in the group. It lies only 0.33 degrees to the southeast of M65, which is located about 3 degrees to the south-southeast of Theta Leonis. 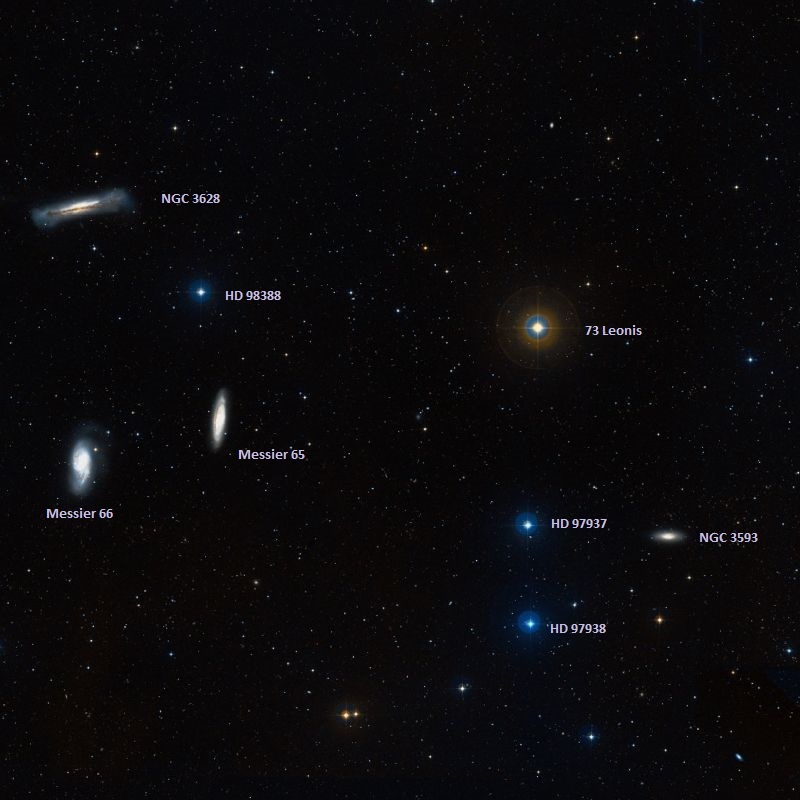 Messier 66 and Messier 65 are visible even in small binoculars, which reveal two fuzzy patches of light, Small telescopes will show the galaxies’ oval shapes and brighter centres. Medium-sized telescopes will reveal the bright cores more clearly, while 10-inch and larger telescopes will show hints of the spiral arms. The best time of year to observe M66 is during the months of March, April and May. 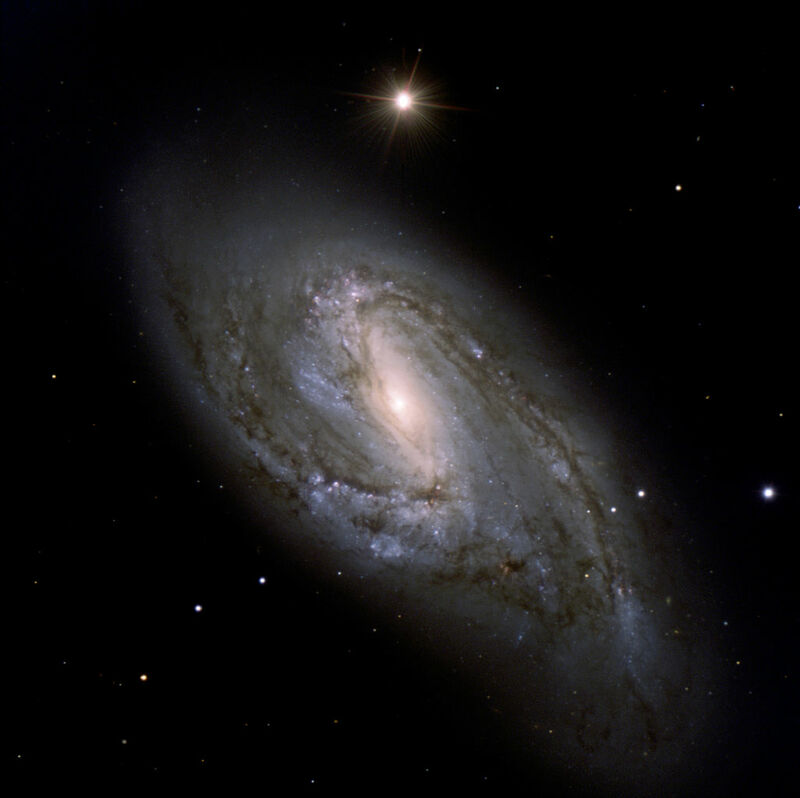 Messier 66 is the most prominent member of the Leo Triplet, also known as the M66 Group, which consists of M66, M65, NGC 3628 and possibly two other galaxies. M66 is notable for its outstanding dark dust lanes and bright starburst regions along the spiral arms. The galaxy is receding from us at 727 km/s. Gravitational interaction with the nearby galaxies Messier 65 and NGC 3628 has significantly affected M66. The galaxy’s past encounter with NGC 3628 has resulted in an extremely high central mass concentration, asymmetrical spiral arms and a clump of H I material – an interstellar cloud composed of neutral atomic hydrogen (H I) – removed from one of the galaxy’s spiral arms. As a result, the galaxy appears to have a conspicuous and unusual structure of spiral arms and dust lanes. The distorted, hooked spiral arms appear displaced above the plane of the galaxy’s disk. For this reason, Halton Arp included M66 in his Atlas of Peculiar Galaxies as Arp 16. Hubble has snapped this view of Messier 66, the largest “player” of the Leo Triplet, and a galaxy with an unusual anatomy: it displays asymmetric spiral arms and an apparently displaced core. The peculiar anatomy is most likely caused by the gravitational pull of the other two members of the trio. The encounter with NGC 3628, which occurred roughly a billion years ago, affected both galaxies, displacing M66’s bulge slightly from the centre and ripping out a 300,000 light-year tidal stream of stars from NGC 3628. Four supernovae have been detected in M66 so far: SN 1973R in 1973, SN 1989B in 1989, SN 1997bs in 1997, and SN 2009hd in 2009. The brightest of these, SN 1989B, first spotted on January 31, 1989, reached magnitude 12.2 on February 1, 1989. SN 1973R, a Type II supernova, reached magnitude 15 on December 12, 1973. SN 1997bs was detected on April 15, 1997 about 13 arc seconds west and 67 arc seconds south of the galaxy’s centre. It reached magnitude 17 and was classified as Type IIn. SN 2009hd was discovered at magnitude 15.8, 28 arc seconds east and 42 arc seconds south of the core of M66 on July 2, 2009. X-ray observations of the galaxy have revealed a number of black hole candidates, including a supermassive black hole candidate at the galaxy’s core. The spiral galaxy NGC 3627 is located about 30 million light years from Earth. This composite image includes X-ray data from NASA’s Chandra X-ray Observatory (blue), infrared data from the Spitzer Space Telescope (red), and optical data from the Hubble Space Telescope and the Very Large Telescope (yellow). The inset shows the central region, which contains a bright X-ray source that is likely powered by material falling onto a supermassive black hole. 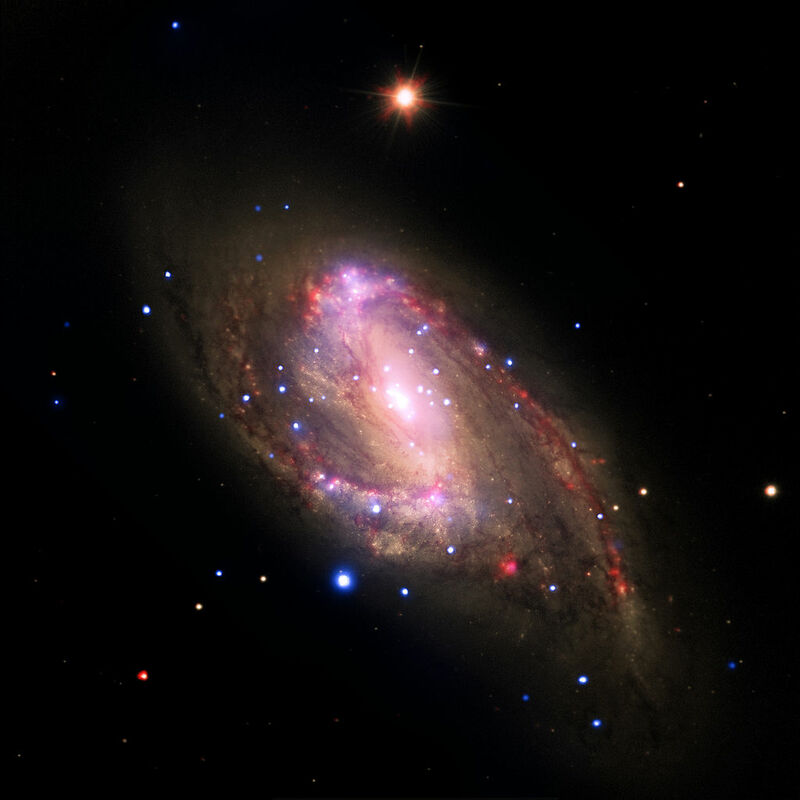 A search using archival data from previous Chandra observations of a sample of 62 nearby galaxies has shown that 37 of the galaxies, including NGC 3627, contain X-ray sources in their centers. Most of these sources are likely powered by central supermassive black holes. The survey, which also used data from the Spitzer Infrared Nearby Galaxy Survey, found that seven of the 37 sources are new supermassive black hole candidates. Confirming previous Chandra results, this study finds the fraction of galaxies found to be hosting supermassive black holes is much higher than found with optical searches. This shows the ability of X-ray observations to find black holes in galaxies where relatively low-level black hole activity has either been hidden by obscuring material or washed out by the bright optical light of the galaxy. 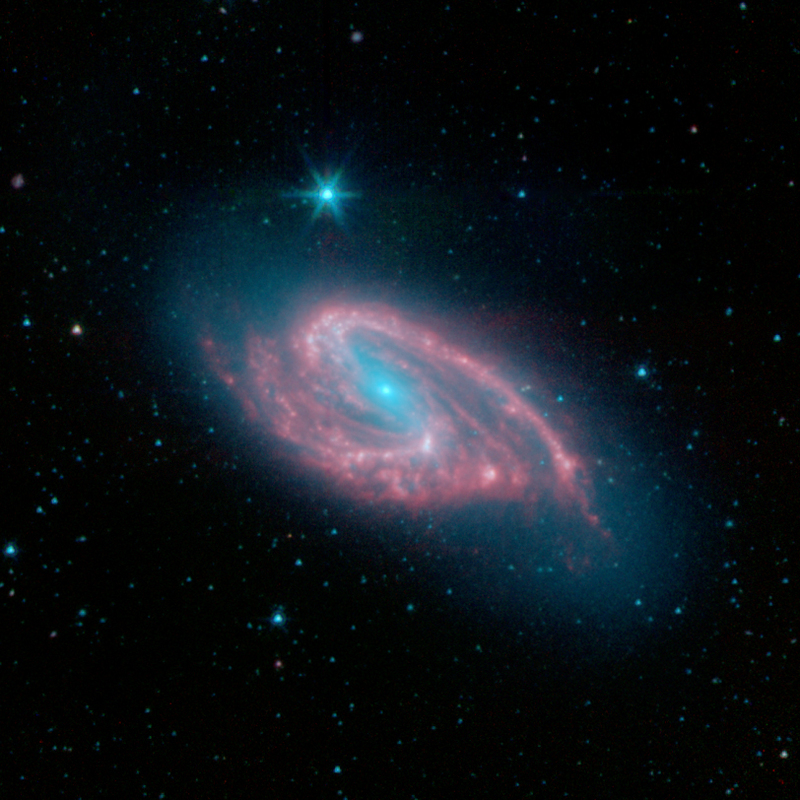 Messier 66 is one of Charles Messier’s original discoveries. The comet hunter found it together with its neighbour M65 on March 1, 1780 and added both objects to his catalogue. 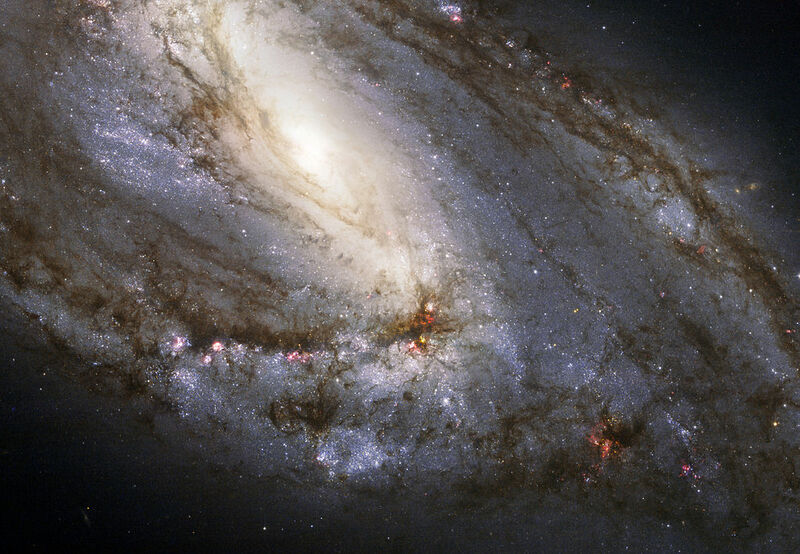 The third member of the M66 Group, NGC 3628, was not discovered until April 8, 1784, when William Herschel found it with his telescope, which was considerably larger than the one Messier used. Admiral William Henry Smyth wrongly attributed the discovery of M65 and M66 to Messier’s colleague Pierre Méchain and a number of sources adopted the error, even though Messier had not acknowledged Méchain’s sighting, which he had always done. A large elongated nebula, with a bright nucleus, on the Lion‘s haunch, trending np [north preceding, NW] and sf [south following, SE]; this beautiful specimen of perspective lies just 3deg south-east of Theta Leonis. It is preceded at about 73s by another of a similar shape, which is Messier’s No. 65, and both are in the field at the same time, under a moderate power, together with several stars. They were pointed out by Méchain to Messier in 1780, and they appeared faint and hazy to him. The above is their appearance in my instrument. These inconceivably vast creations are followed, exactly on the same parallel, ar Delta AR=174s, by another elliptical nebula of even a more stupendous character as to apparent dimensions. It was discovered by H. [John Herschel], in sweeping, and is No. 875 in his Catalogue of 1830 [probably an erroneous position for re-observed M66].